I’d love to say that I’m preparing a feast (I’m not) or enjoying the sun (it’s gray out), but I’m honestly caught up in a Once Upon a Time Netflix marathon (don’t judge me). But just because I’m marathoning it out instead of doing something productive (writing) doesn’t mean I can’t enjoy a little lazy Monday snack. Drizzle popcorn with olive oil. Add sea salt. 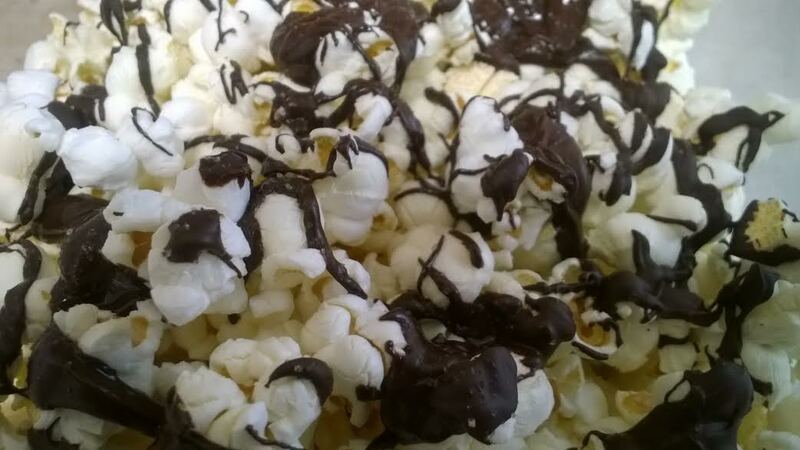 Using a baking spatula, drizzle melted chocolate chips over popcorn. Refrigerate for 20-30 minutes or until chocolate has set. Now excuse me while I procrastinate. What do you mean you aren’t writing?